The original home of St. George Serbian Orthodox Church in Kansas City, Kansas, sat on the banks of the Kansas (Kaw) River. For Orthodox Christians on the Old Calendar, today is the feast of Theophany. I’m hoping to air a whole podcast on Theophany very soon, but in the meantime, I thought I’d reprint an article about a Theophany celebration that took place one hundred years ago. The waters of the Kaw River are to be blessed as are the waters of the Danube and the rivers of Servia. The ceremony will take place at 11 o’clock this morning on the Central Avenue Bridge. The Rev. John Markovich, rector of the Servian Orthodox Church in Kansas City, Kas., will officiate. The ceremony is performed on what is known as the Feast of the Three Kings, in commemoration of the visit of the Magi to the infant Jesus in the manger. This feast was last Thursday, but as the members of the church were at work in the factories it was decided to celebrate today. In Servia and countries where the Greek branch of the Catholic Church holds sway the rivers are blessed each year. From these rivers is drawn the water used in the rites of the church. 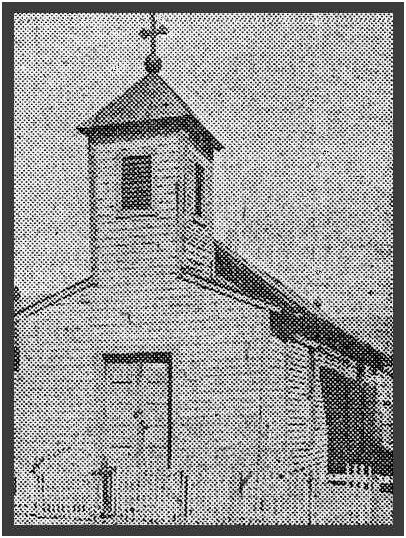 The little church of St. George at 37 North First Street, Kansas City, Kas., stands near the Kaw River, and from that stream is drawn the water used for its rites. Hence the Kaw, like the rivers of the Old World, is to be blessed on the Feast of the Three Kings. The Servian societies of St. George and St. Jovan will meet at the church at 10:30 o’clock this morning and march to the river. When the center of the stream is reached the priest will bless the water. Then he will lower a bucket and draw up water which he will distribute among church members. The Kaw is not “blue” like the Danube, nor clear like the mountain streams of Servia, but to the members of the little church in the Servian colony along its banks its muddy waters will be just as sacred as those of the rivers in their native land. In the midst of traffic the quaint rites of a ceremony handed down from the Middle Ages were observed on the Central Avenue Bridge in Kansas City, Kas., yesterday when the Kaw River was blessed as the Danube and the rivers of Servia have been blessed since Christianity was preached in the days of chivalry. Three hundred Servians gathered around a little altar on the lower floor of the bridge. They stood with bowed heads while a priest in vestments of silk brocaded with silver, like those worn on similar occasions centuries ago, performed the ceremony in the same way that it was done then. Trolley cars rushed along the elevated structure above them, the smoke of the packing houses formed a background and the whistle of a switch engine in the railroad yards a hundred feet away prevented the people from hearing all that the priest said. But the altar boys chanted, the censor was swung and drops of water were sprinkled upon the heads of the parishioners. The priest was Father John Markovich, pastor of the Servian Orthodox Church of Kansas City, Kas. The people were the parishioners of the little church of St. George at 37 South First Street, and the ceremony was a part of the services held in observance of the Feast of the Three Kings, in commemoration of the visit of the wise men to the infant Jesus. In Servia the Danube and other rivers flowing through the principality are blessed every year. Instead of the clear waters of the “Blue Danube,” the people of St. George’s Church now see every day the muddy waters of the Kaw. They work in the packing houses all week and so the feast, which was last Thursday, was not celebrated until yesterday. The Servian societies of St. George and St. Jovan met at 10 o’clock yesterday morning at the church, held services and led by a band marched to the Central Avenue Bridge. First in the procession came two altar boys in white surplices, one carrying a silver crucifix and the other a censor. They were followed by the Rev. Father Markovich, dressed in the silk, silver brocaded vestments of the church brought over from the Old Country. In the middle of the bridge he took the crucifix from the altar boy, turned east, north, west and south, making the sign of the cross in each direction, and he made a prayer blessing the waters of the river. A bucket was lowered and brought up filled with water. The choir boys chanted while he cast a few drops in each direction. The people came one by one and kissed the cross. Then the priest sprinkled a few drops of what was now holy water on each bowed head and blessed each parishioner. Since the custom was inaugurated in Servia in the Middle Ages it has been the belief that after a river has been blessed its waters will not overflow or do any harm, but will bring prosperity to the people living along its banks. The Kansas City Serbs were obviously trying, as best they could, to maintain their Orthodox traditions in a rather strange land — a land with not only a muddy river and a traffic-filled bridge, but jobs that didn’t allow for a festal day off. They made do by observing the feast a few days late. I especially like the idea, most clearly expressed at the end of the first article, that, by blessing the waters, the Kaw becomes just as sacred as any river in Serbia (or, for that matter, the Jordan itself). In a very special way, Theophany takes America, a foreign land for Orthodoxy, and blesses it, makes it holy. It sends the message that, even though we may not have two thousand years of history and saints and ancient churches in our country, we too are Orthodox, and salvation can be accomplished here just as much as it can be in a traditionally “Orthodox” land. I liked the misspelling of censer (or thurible if you favor the Latin version)! How big did the acolyte have to be to swing a full-grown censor?